As Disney Wonder’s first restaurant to offer live music and entertainment, Tiana’s Place couldn’t be a more perfect choice for dining and dancing through the night. 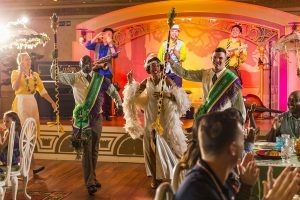 Not only is this French Quarter, southern-style restaurant inspired by the 2009 film The Princess and the Frog in décor and design, but Princess Tiana herself is there welcoming guests, singing and dancing along with The Crawfish Crooners jazz band, and ultimately leading a table-winding parade in which kids are encouraged to grab their instrument-shaped menus and follow along in the soul-affirming celebration. Other dining highlights on Disney Wonder include the introduction of the popular “Draw Your Own Character” show at Animator’s Palate and the recent expansion of the Palo menu to include more Northern Italian dishes and a delightful-twist-on-a-dessert-favorite: amaretto soufflé (in case you want to stuff something other than chocolate soufflé in your face). 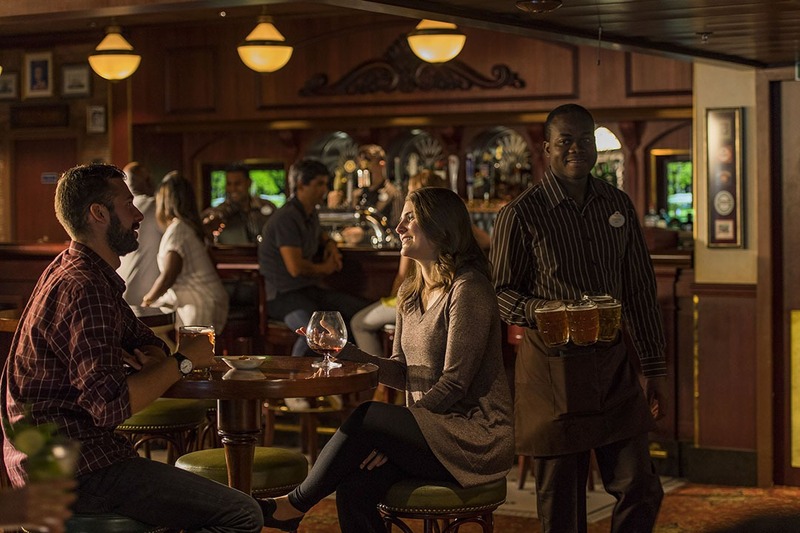 There’s definitely a sense of awe, arrival, and actual accomplishment as you walk into this inviting neighborhood pub you’ve been waiting your entire cruising life to experience at sea. There are a number of international beers in bottles and on tap, but the drink in your hand (regardless of proximity to burning sand) just has to be their custom ESB — also called Crown & Fin — that is super-smooth and hardly bitter at all. Pull up a comfy green-padded stool at a high-top table or find a booth to sink in so you can laugh and talk all evening … or simply try to absorb all the attentions to detail, Disney or otherwise. Wandering Oaken’s Trading Post, a winter cabin seemingly dropped into the Oceaneer Club from straight out of Arendelle, boasts toys and hidden treasures on every flat surface as well as animated windows from which a friendly “hoo-hoo” can magically pop out at any moment. But it hardly tells the entire Oceaneer Club renovation story. 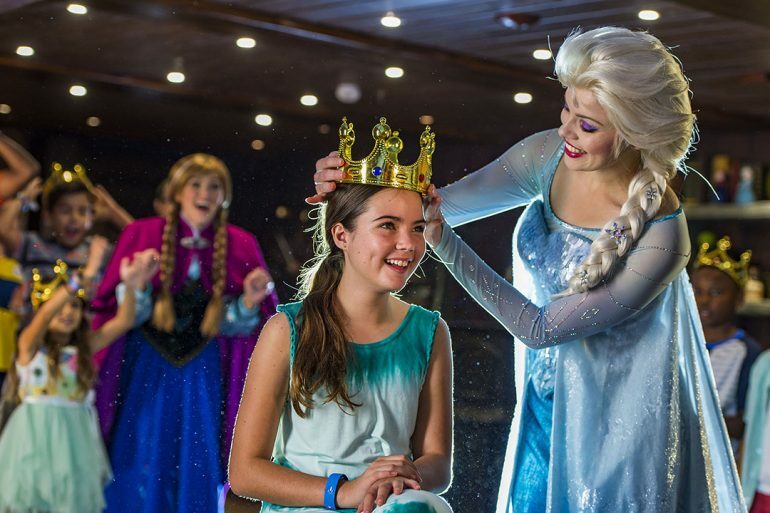 The Oceaneer Club has always offered kids the opportunity to meet characters and have fun in a designated no-adults space. 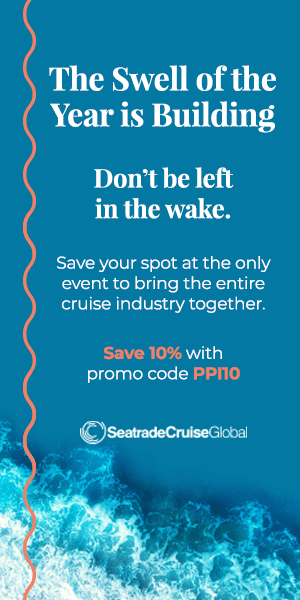 But the pirate ship theme that once defined the room has now broadened into multiple spaces telling stories and offering interactions for a wide range of ages. 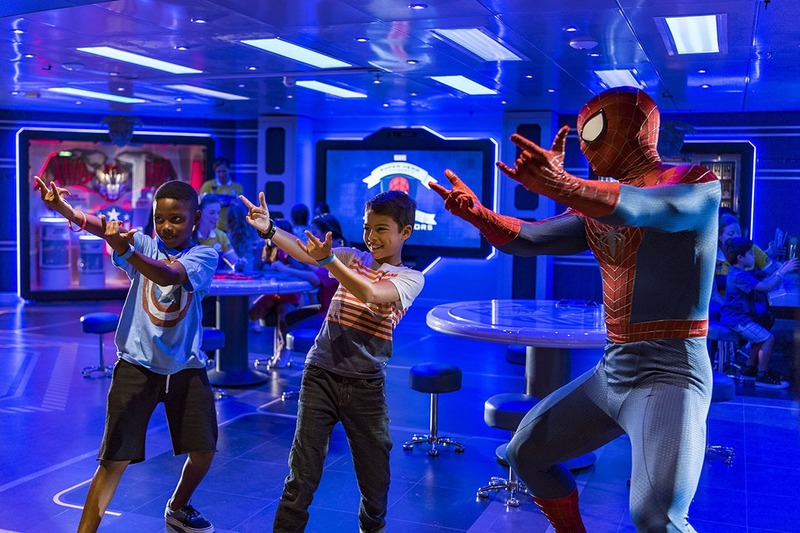 New themed spaces include Club Disney Junior (where characters like Doc McStuffins appear to treat stuffed animals), Andy’s Room (where Toy Story favorites come to life), the Frozen Adventures section (“hoo-hoo”), and, most notably, the Marvel Super Hero Academy. The idea behind this high-tech command center — complete with docking bay doors and life-size video screens and super hero weapon displays — is that it’s “a shield bunker that got repurposed by the world’s greatest heroes to create an academy where we can teach kids how to be the heroes of the future,” says Tony Giordano, Show Director, Walt Disney Parks and Resorts. Programs within the academy include, for instance, Captain America teaching courage, teamwork, and standing up for what you believe in, all while helping kids build their own shield. 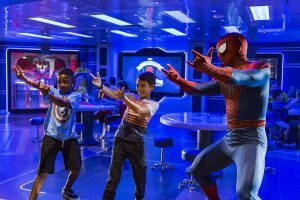 Spider-Man might then appear and help kids perfect their spidey senses through games and web-slinging exercises. They can then take those lessons to crack codes, complete villain dossiers, and, most awesomely, use them in a larger-than-life video game. The top pool deck has been redesigned every wet step of the way, but Dory’s Reef makes the biggest splash. Within this glass-enclosed splash zone, both Dory and pink octopus Pearl take turns squirting water at toddlers, as do a number of other floor-bound (and hidden) spouts. Parents can monitor their kids from outside the glass (right next to the AquaLab pool) or venture inside and hope reef-revelers don’t get too tipsy with the water buckets. 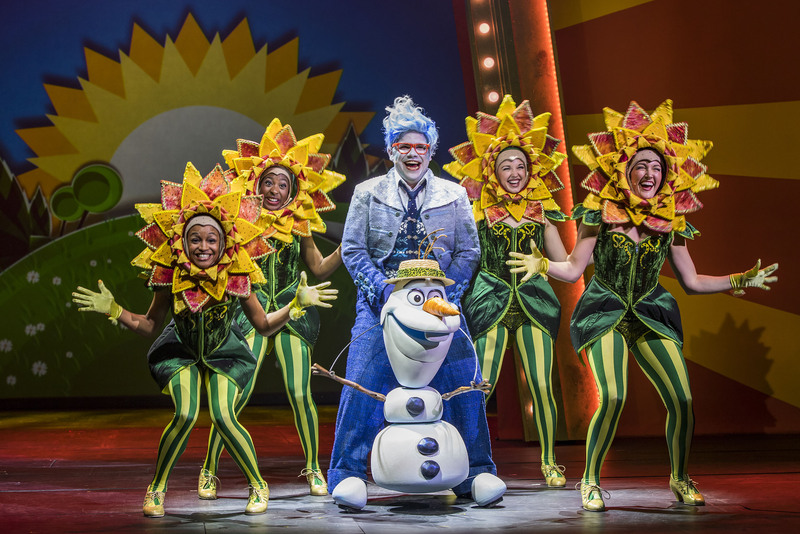 But c’mon — when in summer, do as the frozen things do. So that’s why every Frozen song is simultaneously playing in my head! Disney Wonder does have the only stage on the planet showing this all-new, live-action musical, but “totally strange” isn’t the right phrase here at all. 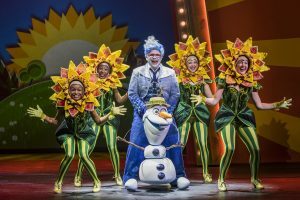 The story that movie-goers adore is faithfully told (and sung) here, with imaginative devices spanning from puppets and projection to transforming sets and stage-broadening swirling storms all bringing the beloved animation to something even larger than life. “I think the hardest thing was to create a production that truly blended the line between scenic and costume, between puppet and puppeteer, between scenery and projected image,” said Walt Disney Imagineering Creative Executive Kevin Eld just before the show’s at-sea premiere last week.